There cannot be a better way to get introduced to the oil painting world than through the masters of the art. In the e-book 'Getting Introduced to Oil Painting' you will get to learn about things that cannot be taught in any art class. Before, you start learning the art of oil painting, 'Getting Introduced to Oil Painting' prepares the ground for it. It gives you inputs about the origin of the art and the basic things that you need to know about it. You may wonder - Why is it so necessary? Well, It's upon you to decide - what do YOU want to be - Just another Oil Painter or a Master Painter? Therein lays the answer to all your questions. To be a master in the field, get the 'Perfect Introduction' through the ace oil painters themselves. * Introduction to oil painting mediums - What is linseed oil and what are the different forms? 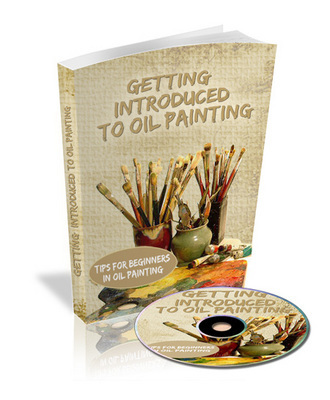 The e-book will give you acquaint you with the basics of oil painting. It gives you a fair idea about the origin from where the oil painting technique has been developed. It also helps you to understand in detail about the different binders used in oil painting. This would help you in creating a proper understanding about the main requisites for oil painting. It gives you a thorough know-how of oil painting. * What to choose and what to avoid? * Where to invest and where not to? * How to select the best painting brush while getting started? * Which type of canvas to choose? * Which type of oil painting medium is best for beginners? All this and mush more are available at a very reasonable rate, because I believe that knowledge cannot be priced high so that it goes useless. It must be made available to as many as possible at the least cost! Exciting Bonus Features with your Order!!! Getting Introduced To Oil Painting - Ebook & Audio Book - With Master Resale Rights (mrr) - Download ! !